ATP and WTA ranking chart 2018 – Novak Djokovic and Simona Halep reigned on top of the recent ATP and WTA ranking charts 2018 for men’s singles and women’s singles respectively. With 8,045 points, Djokovic who has enjoyed a good year for himself will end the year on top after coming back from injury earlier in 2018. Elsewhere in the WTA rankings, Simona Halep with 6,921 points maintained her status as the best-ranked women’s singles tennis player to be followed Angelique Kerber and Caroline Wozniacki. Going ahead with ATP and WTA ranking chart 2018, Novak Djokovic returned at the top of the rankings for men’s singles, replacing Rafael Nadal to become only the second player ever to make a comeback from outside the top 20 to the number 1 spot in the same season. After having undergone surgery in his right shoulder in January after suffering an injury in the Australian Open, Djokovic returned in April in the Rolex Monte-Carlo Masters from where he has gone onto register a 43-5 match record, including a 31-2 mark since the start of Wimbledon. Winning the Wimbledon title, the US Open and beating Roger Federer in August at the Western & Southern Open in Cincinnati to become the first player to win titles at all nine ATP World Tour Masters 1000, Djokovic has had a year in professional men’s tennis like no one else. He is followed by Nadal at 7,480 with Federer remaining at third. Djokovic and Nadal will now battle to become a five-time year-end No. 1 in the ATP Rankings at the Nitto ATP Finals, the end of the season tournament in London from 11-18 November. Nadal currently sits on top of the ATP race to London pile, followed by Djokovic and Federer. 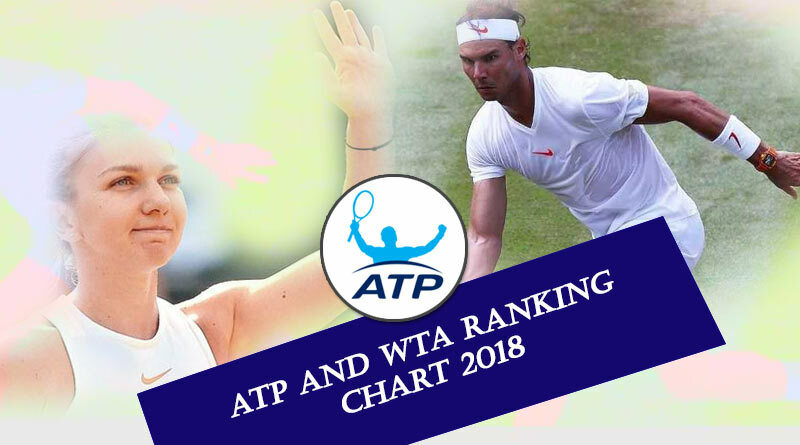 For more details on ATP and WTA ranking chart 2018 and related updates, like and subscribe to tentaran.com.